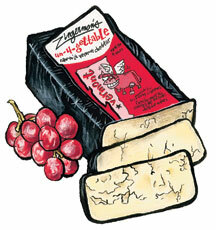 Zingerman's 4 yer aged cheese for sale. Buy online at Zingerman's Mail Order. Gourmet Gifts. Food Gifts. Big, beefy cheddar from Vermont. This is one of those rarely seen, really old cheddars you read about but can almost never find. While a cheese can always be aged for a long time, most don't have the fortitude for it. Even with cheddar, which can age several years, you'll often find cheeses that develop "bitey" and sour flavors. Not here. The flavors are strong but balanced. The trademark cheddar tang is in full force but doesn't dominate. This phenomenal cheese is sure to bring any sharp-cheddar lover into an altered—but highly desirable—state of dairy affairs.